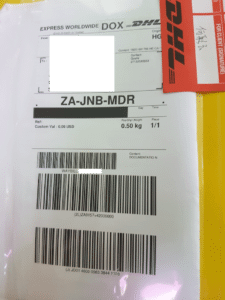 An example of a DHL courier waybill. If you are looking to have your official South African documents legalised or have documentation you need to send to us, or have returned to you once we have collected it and do not have the energy to do it yourself, or live abroad and cannot easily do it, we offer convenient and fast solutions. All you have to do is courier us your documents and tell us what you need. It is as easy as that. Obviously, we do not cover the cost of the courier, but we also do not charge more than necessary for it. We are based in South Africa, so getting your documents to our offices can be done express or overnight and you have a range of options to choose from. We can collect and deliver your documents once apostilled or legalised, or you can use a courier of your choice, whichever works best for you. 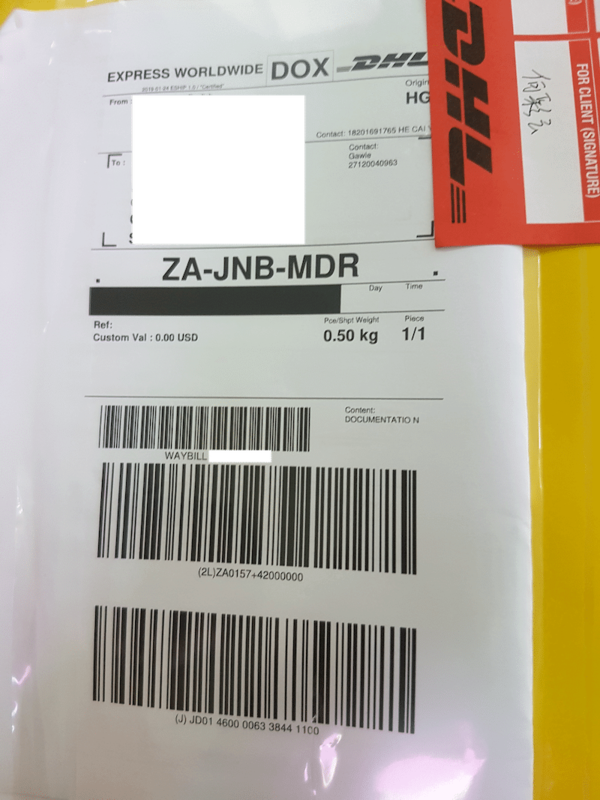 Can apostil.co.za return my documents to me? Yes, of course we can, and we must! You have to pay for this, at a fair rate – we do not aim to profit off courier fees. We can collect and deliver your documents from our location in Pretoria, the costs are on our pricing page. If you courier your documents to us and only need us to courier it back to you, there is a price for return courier within SA or for an international address. We also offer to “collect courier” from any address you give us, but this naturally is more expensive. In this scenario, we instruct a courier company to collect the documentation from your address and they will arrive to pick it up. It is important to have everything ready in an envelope once they arrive. We usually scan and email your documentation to you before couriering. Once we have couriered to you, we send you the waybill (tracking number and information) so that you can track the progress of your courier package to your doorstep. Which couriers can I use to send my documents to Apostil.co.za? You are welcome to organise a courier to drop your documents off with us and pick them up once we have them. South Africa has a huge variety of courier companies that you can use to get your documents to our offices practically overnight and back to your doorstep again. apostil.co.za will not be held liable for any incorrect action by any courier company, as this is the responsibility of the couriers themselves. Whether you are using a courier service to send us your documents on a domestic or international scale, it remains your responsibility to pay the postage before your documents are dispatched to our offices. Any unpaid packages will not be accepted by apostil.co.za. As mentioned, we accept no risk and are indemnified against any loss or delay of documents. See our terms and conditions here. Please keep in mind that although we indicate an estimate of the courier fees, we will not be able to give you exact pricing until we have discussed your needs and turnaround times with you. Another thing to keep in mind is that courier fees do not include document legalisation fees or any other fees. The fees we charge to deliver your documents to you (should you choose that option) covers our courier fees exclusively. Feel free to get in touch with us so that we can discuss details and pricing with you depending on your documentation needs. Once you have a telephonic and emailed quote, you can decide to proceed.